It is very difficult for everyone to purchase and maintain the CCTV camera for home security. Actually, this camera is using to protect the house, shop from illegal activity by others. The cost of the operating system is very high and a person will be deputed to maintain data and secure connectivity with backup. But you can use your Smartphone as CCTV to secure home and operate from Apps. A common man can’t afford this type of expenditure. Here I would like to introduce alternative tools to meet out all facility as avail in CCTV. To make your security device, you will have an old Smartphone with the camera. Use this device like CCTV to secure your home. Google play store provides the number of application to convert your Smartphone in the security camera. Here I will suggest you download the “IP Webcam” app in the Smartphone. Now open this app in Smartphone and go in the Menu option. You will see the option of “Start Server” in the lower section. When you click this option, the camera will automatically open. Now you can see everything, which will come in front of the phone camera. After all, you will get a URL address in below part of the camera like – http://172.32.15.110:80345 etc. It is mandatory to use these tools, your computer is equipped with an Internet facility. Otherwise above IP Address will not see. When using this app, on an internet connection. The user can see the live picture of the phone on the computer by copy this IP Address and place on the browser. All recorded video will display on the screen instantly. 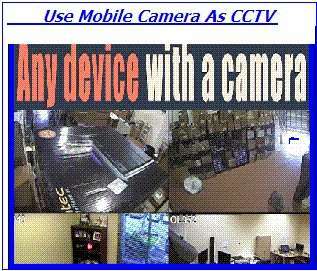 I think it is clear that "How to Use Mobile Or Smartphone Camera as CCTV to upgrade home security system". Your friend can also see the recorded video on his computer by this IP Address.